I am developing a site which has a component which is optimized for desktop or big view-ports, and tells users to use the "Tablet in landscape mode". When not on mobile, a message saying "Use tablet or phone" is shown. The text is fine but I am unable to put something that can visually tell a person to rotate the tablet. 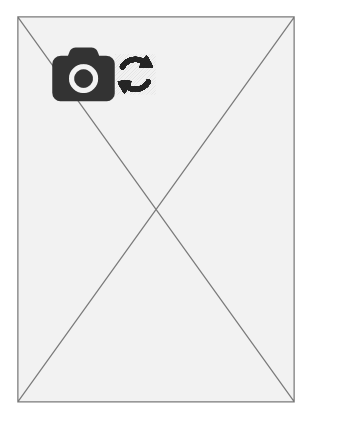 What is the most efficient way to tell the user to use the tablet in landscape orientation? In many sports apps when you check the standings table you only get limited data (such as no. of games, points) and when you want to see all columns (no. of goals, wins, etc.) you need to rotate the screen to landscape mode. 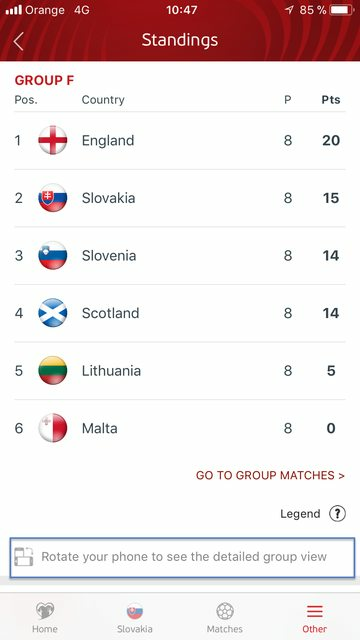 Multiple times I've seen a solution like in the UEFA European qualifiers app - a logo with an explanatory text above or below the table. If the rotation is a must, i.e. you can't show some subset of data in the portrait mode, try to implement the solution as mentioned in this question. I've also seen this solution a couple of times and I liked it. Regarding the icon - here are many examples for inspiration. Bonus points for adding a subtle animation that catches even more attention. Never do this, all it's going to get someone to do is uninstall your app. Relayout your data to show it in portrait mode. Not the answer you're looking for? Browse other questions tagged gui-design interface visual-cues or ask your own question.